Mitsubishi says two new concept cars will hit Tokyo for the big motor show next month. One shows off its continuing work on wheel-hub MIEV electric vehicles, the other its emerging design language, diesel tech and driver-assistance functions. The i MIEV sport (shown) adds a pinch of sporting dynamics to the company's range of electric prototypes by adding the same S-AWC (Super All Wheel Control) as will appear in the new Lancer Evo X. The Concept-ZT show car brings the company's new styling language to a larger-car platform, with a 2.2-liter clean diesel and a raft of driver-assistance functions including lane-drift warning, all-around-view monitors, parking assistance, and arterial thrombosis detector. Sorry, just seeing if you'd tuned out. Click through for full detail sheet. Tokyo, September 7, 2007 — Mitsubishi Motors Corporation is proud to introduce three concept cars at the 40th Tokyo Motor Show. Each car is a different expression of the three pillars of Mitsubishi Motor's vehicle strategy: driving pleasure, reassuring safety and environmental responsibility. Held at Makuhari Messe, the 40th Tokyo Motor Show is open to the public from October 27 through November 11, with press and media days October 24, 25 and 26. Based on the i MiEV,*1 the pinnacle of Mitsubishi Motors's environmental technology, the i MiEV SPORT maximizes the sporty possibilities of the zero-emissions electric vehicle. The high power and environmental performance of its electric motors make it an exhilarating drive that delivers superior environmental performance. The Concept-ZT showcases an advanced level of driving pleasure, safety and environmental responsibility — Mitsubishi Motor's vehicle strategy — wrapped in a realistic package. Under the hood, a newly developed fuel-efficient, 2.2-liter clean diesel engine is mated to the new Twin Clutch SST (Sport Shift Transmission). Concept-ZT also features advanced active safety as well as passive safety technology, such as its pop-up hood. Developed from Mitsubishi Motors' legendary SUV experience, the Concept-cX is a compact SUV with nimble running performance and utility on roads, as well as solid environmental performance. 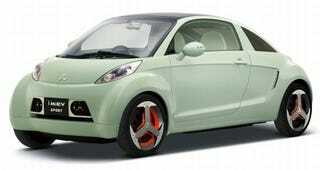 Based on the i MiEV, the i MiEV SPORT enhances the "driving" image of Mitsubishi's electric vehicles. The car features Mitsubishi Motors' unique in-wheel motors in the front plus S-AWC (Super All Wheel Control) — the company's vehicle dynamics control system — to achieve high maneuverability as well as high levels of both environmental and running performance. The car brings a new closeness between people and cars; allowing them to become more a part of daily life. The "fastback" exterior design expresses the quickness of the car with an appearance that is pleasing and lively. An efficient, environmentally friendly electric vehicle thanks to its compact size, it also possesses exceptionally fluid styling. A simplified interior styling creates a pleasant space, allowing occupants to feel at home. Geometry, metallic materials and body epitomize the futuristic electric vehicle. Interior lighting, too, has been carefully thought out, with the use of many blue LEDs suggestive of nature, creating a sophisticated, cutting-edge atmosphere. The light green exterior marks another association with nature. The pearlescent paint, which shines when hit with direct light, brings feelings of advanced, futuristic technology and environmental peace of mind. The interior is sporty and dynamic as a result of the substantial use of mesh materials, while the space, with various natural elements, fosters feelings of both security and comfort. Like the i MiEV, i MiEV Sport uses a rear-midship design in its layout. Making use of the relatively long wheelbase of this platform, a high-capacity lithium-ion battery is installed in the lowest area under the floor, and components including a motor and inverter are arranged beneath the luggage compartment. This layout provides optimal distribution of weight, front and rear, and a lower center of gravity for stability, sporty performance, and a spacious interior. An aluminum space frame — a combination of aluminum extrusions and aluminum die casting — is light, rigid and strong; helping to improving performance by minimizing weight. The optimum layout of structural members, including front-side and cross members, efficiently absorbs crash energy in the event of front-end or side collision. In a collision from the rear, EV components under the back seat and rear floor serve as a barrier to ensure the integrity of the passenger compartment. By making use of the rear-midship layout and utilizing Mitsubishi's latest RISE (Reinforced Impact Safety Evolution) body, the concept realizes excellent occupant protection in collisions from any direction, even when colliding with a vehicle of different height or weight. The system employs a structure consisting of three permanent magnetic synchronous motors. One in-wheel motor is placed at each front wheel; a single motor drives the rear wheels, as is used in the "i MiEV" system. An E-4WD system electronically optimizes the output of all motors. In addition, a new E-AYC (Electric Active Yaw Control) system is employed to directly regulate torque at the left and right rear wheels via an electric motor. In addition to the E-4WD and E-AYC, the S-AWC system integrates ABS and ASC (Active Stability Control) systems, thus independently controlling driving force, traction and braking at all four wheels, for total maneuverability and maximum stability. Energy-saving environmental considerations are seen throughout the i MiEV SPORT. Effective use of energy is achieved by installing an auxiliary photovoltaic generator on the roof, a power-generating fan inside the front grill, and regenerative braking functions to recover energy when the car is slowing down. Much of the lighting is by bright, power-saving LEDs, including in the rear combination lamps and vehicle interior, and the efficiency of the air conditioning is enhanced by the use of heat-absorbing window glass. In addition, Green Plastic — Mitsubishi Motors' unique plant-based resin technology — is used wherever possible for interior components in another nod to the environment. By combining a high-powered, fuel-efficient, 2.2-liter clean diesel engine and Twin Clutch SST, and using significant quantities of Green Plastic in the interior, a high level of running and environmental performance is achieved. In addition to advanced active safety technology, Concept-ZT achieves a high level of passive safety. Features include pre-crash safety; a lane-drift warning system; driving assistance technology, including new all-around multi-monitors and a parking assistance system; and crashworthiness safety technology including a pop-up hood. Moreover, equipped with the S-AWC system combining front E-LSD (Electric control - Limited Slip Differential), ABS and ASC, based on Mitsubishi Motors' 4WD electronic control system, the MITSUBISHI Concept-ZT is a premium sedan that possesses dramatically improved driving, environmental and safety performance. The basic exterior form, simple and flowing with a low center of gravity, yields a sense of stability and sportiness fitting Mitsubishi Motors' premier sedan This base is combined with a powerful shoulder line, substantial side panels and projecting fenders. Sculptured headlights, grill and aluminum wheels proclaim quality and status created out of "Japanese" sensitivity — a sophisticated and adult sensibility. In the interior, the goal was a level of "hospitality" that would resonate with all the senses of the occupants. Combinations of designs with clear contrasts — simple forms with overall continuity gently embrace passengers and precise, hard functional parts — express the melding of quality, comfort and the pleasure of driving. Meters and monitors are of clear materials, futuristically stacked, with the beauty of industrial art. The concept's powerplant is a newly developed 2.2-liter 4-cylinder DOHC, 16-valve with VD (Variable Diffuser)/VG (Variable Geometry) clean turbodiesel engine with common-rail direct fuel injection (piezoelectric injector) that delivers a maximum output of 140 kW and maximum torque of 400 Nm. The power unit is mated to Mitsubishi's new Twin Clutch SST, which delivers superior power transmission efficiency in a powertrain that realizes smooth, responsive, effortless power and acceleration, whether on the highway or in urban areas, together with good fuel economy. The S-AWC system combines front E-LSD (Electric control - Limited Slip Differential), ABS and ASC with the 4WD electronic control system also used in Outlander and Delica D:5. This optimally controls driving force, traction and braking at all four wheels, and provides stable driving on various road surfaces under various conditions, realizing a pleasurable and safe driving experience. Pop-Up Hood: If the car should hit a pedestrian, the hood pops up before the person's head strikes the hood, acting as a buffer and minimizing injury to the head. New All-Around Multi-Monitors: In addition to a nose-view camera and a rear-view camera, cameras with extremely wide-angle lenses are positioned at the left and right sides. Optical distortions of the images from the four cameras are corrected, and the information is converted into a display of the situation all around the car as seen from the top — thus enabling clear confirmation by the driver. The nose camera is also part of the proximity-detection function for approaching objects.